In my recent post on the subject of exodus in 1 Samuel 1-7, I observed the way that the narrative explores themes of strength and weakness. At the battle of Aphek, the Ark of the Covenant, which was supposed to bring supernatural power to the aid of the Israelites, turns out to be a damp squib: it is captured by the Philistines and taken into captivity, placed at the very heart of their civilization, next to their god Dagon in his temple. At that point, however, what once seemed weak and powerless begins to display immense and terrifying power and the world of the Philistines starts to collapse around it. It begins with the statue of Dagon falling on its face before the Ark. He is placed back on his pedestal, but the next day he has fallen again, but now is dismembered and decapitated. His hands lie on the threshold, as if he were seeking to flee from the terrifying presence of YHWH in his own temple. Over the coming months, the territory of the Philistines is ravaged with plagues. This isn’t the first time in the Scripture that we encounter Dagon and his temple. In Judges 16, Samson is betrayed by one of those closest to him, one who kisses him but then gives him into the hands of his enemies in exchange for pieces of silver. He is bound, blinded, and imprisoned. He is made a grinder in the prison, a gruelling back-breaking task. The leaders of the Philistines hold a celebration of their victory over him, sacrificing to Dagon in his temple. Samson is brought before them so that they can make mockery of him. The one who was once thought so powerful is a weak plaything for them now, a target for their sport and jest. Samson is placed between the pillars of the temple, one on his right and another on his left. He asks the lad holding his hand to guide his hands to the pillars, so that he can lean upon them. At that point he prays that, just that one final time, God would strengthen him. 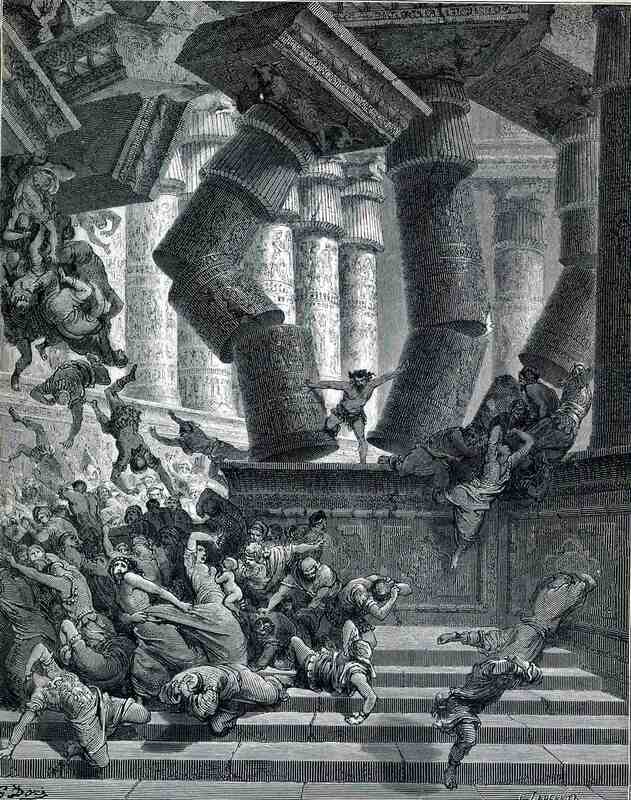 He braces himself on the two pillars of the temple, then pushes with all of his might. The temple of Dagon collapses, falling on all of those within it. Willingly giving up the Spirit that had returned to him in that final act, Samson dies with the Philistines, accomplishing a greater victory in his death than at any point in his life. The temple of Dagon appears on three different occasions in Scripture and, on each occasion, it is the site of a different form of decapitation or head-crushing. In 1 Chronicles 10:10, the severed head of Saul is brought to the temple of Dagon to be displayed. In 1 Samuel 5, it is Dagon himself who is decapitated by YHWH. In Judges 16, we see Samson, who as a Nazirite has separated his head to YHWH (Numbers 6:18), give up that head, with the result of the crushing of the heads of the Philistines. Turning to the gospels, we encounter a story that might be familiar to us. A Man perceived as a great threat by the authorities is betrayed into their hands by someone extremely close to him in an act of seeming intimacy (Luke 22:47), handed over in exchange for pieces of silver. The Man is blinded and mocked (Luke 22:64). The Man once feared and considered so powerful is ridiculed, his impotence apparent for all to see. A crown is placed on the Man’s head, dedicating it (the crown is a sign of consecration: in fact, the Hebrew word for it is the same one as used for the Nazirite’s ‘separated’ or ‘consecrated’ head). The Man is giving the back-breaking task of carrying his cross and is led to Golgotha – ‘the Place of the Skull’ – the site where heads are removed and skulls are crushed. He is placed between two wooden pillars, bearing those crucified with him, one on his right hand and another on his left. The body of disciples depart and their Head is left alone. The Man is taunted: ‘You who destroy the temple and build it in three days, save Yourself! If you are the Son of God, come down from the cross.’ The Man is seemingly abandoned by God and cries out for his presence. Psalm 69 is alluded to in the context on a number of occasions, a plea for God’s help in a time of great need and persecution, a plea for God’s judgment upon wicked oppressors: ‘…let their habitation be desolate; let no one dwell in their tents…’ The Man, with one last gasp of strength, cries out with a loud voice and gives up the Spirit. Immediately, the veil of the temple is torn from top to bottom. The earth quakes, the rocks are split, the graves are opened (Matthew 27:50-53). The whole old world order comes crashing to the ground. In the very act of his death, the Man who was considered powerless accomplishes the greatest victory of all. It is through his crucifixion in weakness that the true power of God is displayed. ‘But we speak the wisdom of God in a mystery, the hidden wisdom which God ordained before the ages for our glory, which none of the rulers of this age knew; for had they known, they would not have crucified the Lord of glory.’ The Man whom they mocked brought the house down. And nothing will ever be the same again. This entry was posted in 1 Samuel, Bible, John, Judges, Lent, Luke, Mark, Matthew, NT, The Atonement, The Atonement, Theological, Theology. Bookmark the permalink. And that was just the beginning. While Christ was the most powerful being who appeared powerless, God now uses truly powerless people to rattle the world. Why do we spend so much time focussing on the powerful? The prince of the air can never rest on his laurels while Christians walk this earth. Thinking about this as we prepare for the Good Friday service here… Thank you. Nicely done. I’ve just discovered your writings – will have to explore more. Your use of Samson as an example of strength made perfect in weakness is similar to my own Easter meditation this year (see the blog post at http://ourfathersworld.org). Thanks for your good words. Thanks, Ed! And thanks for linking to your piece: I’ll take a look.